action, the effects of which are mutual. The three principal methods of playing backgammon are head-to-head, tournaments, and chouette — that is, one person playing against a field of two or more players. Because it is not a duel, chouette in its broadest sense is the most civilized and social form of the game, inspiring both competitiveness and camaraderie. Chouette is organized in an order of strict rotation. Any number of players may participate, but an ideal group is four or five. 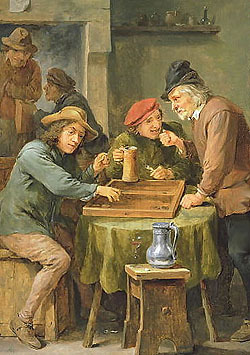 To begin a chouette, each player rolls a single die. The one who rolls the highest number is called the man in the box or simply the box, and he competes against all the others. The man rolling the second highest number becomes the captain of the opposing side, and he will play and roll the dice. All others become the captain’s partners, and though for the moment they cannot play, they may confer with the captain on all his moves and act as a kind of general staff. But though they may advise, they are ultimately bound by all the captain’s decisions, except when offered a double; then, regardless of what the captain does. they may accept or refuse as they see fit. Throughout play, the rotation order is maintained. If the man in the box wins, he remains there, the defeated captain goes to the bottom of the order and each player in turn becomes the new captain. If, however, the captain wins, he becomes the new holder of the box, displacing the man who has just lost, and who is now relegated to the bottom of the order on the opposing team. In the scoring of chouette, the box competes against each of the other players. If he is playing against, say, four opponents and wins a 1-point game, he is +4 and each of the others is −1. On the other hand, if the box loses, he is −4 and each of the other players is +1. During a game the box may double and the captain may decide to retire, but one or more of his advisers may decide to accept the double. If this occurs, the player closest to the top of the rotation who has accepted becomes the captain and plays. If he wins, he becomes the man in the box and the other players rotate in the normal way. A partner who decides not to accept a double is no longer in the game and cannot advise the captain further, but by declining a double, he does not lose his place in the order of play. Because the man in the box is alone, it has been claimed that there is a small but definite percentage operating against him. The reason put forward for this is that if he makes a miscalculation, it will not be pointed out to him, whereas if the captain of the opposing side blunders, he has two, three or even more advisers who can spot and correct their captain’s error before he picks up his dice. It is assumed that because there are four minds at work on the same problem, there is less margin for error, and that therefore the percentages are in their favor. This is probably true, but the box has compensating advantages. Because he is playing by himself, he can make the moves of his choice without interference or argument and need neither explain nor defend his tactics to anyone. More importantly, he is given the privilege of preempting any and all deals among the other players. Concerning deals and settlements, he is the game’s sole judge and adjudicator. For instance, a controversy may arise as to whether or not to double the box. Let us assume that the captain — player A — and player B wish to double, but that C and D think it a poor idea. Further, let us assume that those preferring to double offer to buy out the objectors by giving them a point apiece for their respective games. An agreement is reached and the captain now doubles. The man in the box now has various options. He may agree to play all four games or to drop them. Or he may preempt either or both of C and D’s games; that is, according to the laws of chouette, he can give C 1 point and play three games, or he can give both C and D a point apiece and play the other two games. This rule is an enormous advantage to him, since it gives him a greater scope should he wish to hedge. On the other hand, assume that the box doubles everybody. Each contestant decides whether or not he will accept the double. Player A decides to refuse; player B, on the other hand, decides it is a clear-cut take and not only takes it himself, but offers to take player A’s game as well. Again the man in the box has the right to veto the arrangement, insisting that player A drop to him and not to one of the other players. Whenever any settlement is made among the other players, the box gets first acceptance or refusal, regardless of the amount. He has all claims of prior right. Suppose the bearing-off stage has been reached and a blot has been left. This is a settlement situation (the intricacies of which we discuss here). All kinds of demands and offers are heard — not only among the partnership, but between the box and the partnership. Again, if any agreements are reached between the other players, the box has the right to intervene and take the settlement for himself. Thus, on balance, despite the fact that the box is alone, we believe that the percentages are in his favor rather than against him. The vital point to remember in chouette is that the important games are those played in the box. Whenever you are in the box, therefore, remember that these are the decisive battles and that the degree of your gains and losses will be settled here. Your golden opportunities will almost always occur in the box, particularly when you can win two or three consecutive games. When this happens, there is a tendency for your adversaries to steam; having only the slightest of advantages, they will tend to double, hoping to pressure you prematurely into surrender. Time after time in instances of this kind, we have seen the box retire on the grounds that he has won enough, that he must not be greedy, that having won two or three games in a row, he should now conserve his new-found wealth. This is not only cowardly but foolish. At such moments the box is being offered whet amounts to an emotional double, and instead of dropping he should take. It is criminal to lose your nerve when you are in a hot streak. When the opposing players, falling behind and wrangling among themselves, offer neurotic doubles, the box should accept them with the joy of a man who receives a gift he had not expected. Whenever the enemy is rash, it is a time to attack, not to preserve your gains and retire. Another point might be mentioned here. The concept of “greed” is sometimes greatly misunderstood. Backgammon essentially is a series of calculated risks. There is no reason to be foolhardy, but don’t retrench when you’re going well. For instance, assume that you are 100 percent certain to win a game if you play a move a certain way. An alternative way makes you only a 7 to 1 favorite — but you will win a double game if you get away with it. Which play is correct? It’s not even close; in a money game, play it the second way every time. You’re not being greedy by doing so; you are simply playing the percentages and taking a calculated risk. After the box has doubled in a chouette, a situation may arise which is called a drop-take. In other words, having been doubled, two of the players may decide to accept one double jointly and to drop the other, thereby minimizing their potential loss. Thus, if the box is against two other players and they decide on a drop-take, the box will automatically win 1 point, and with the doubler now at 2, will either win a total of 3 points or lose 1. The two partners will either lose 3 points or win 1. This of course presupposes that there is no further doubling or gammon. Often there are so many players in a chouette that the box will take a partner in order to lessen his risk. This usually happens when six or more players are in the game; therefore, instead of being one against five, say, it will now be two against four. 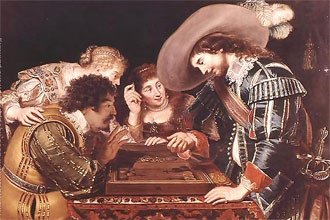 The box may select any member of the opposing team as his partner, providing the player is agreeable, and this usually leads to the best player in the chouette being chosen constantly. A superior method is to force the box, should he wish a partner, to select the player he has just defeated. There is a pervasive logic in this method; it eliminates any favoritism. When the box can select anyone to partner him, it may be awkward for the chosen player. This is especially true if the nominee is constantly picked. He is not obligated to comply, but it is insulting to refuse. If a fair rotation system is devised, however, none of these unpleasant situations arise. Depending on whether or not you are a member of the general partnership or on your own in the box, the strategies of your game should fluctuate. As a partner, you should accede to the majority opinion. This should be done even when you feel the wrong percentage play is being made. Given the fickle make-up of the game, the wrong move may miraculously be right; secondly, everyone is playing for pleasure as well as money, and by not voicing your discontent you contribute to the feeling of good will at the table. More importantly, in any game in which you are not in the box, you are playing for only 25 percent of the stake if there are, say, five players. In addition, if all of the captain’s advisers object to his proposed move, he should comply with the majority opinion, though if he cared to, he could insist on his own way. These are the manners of backgammon, the game’s civilities. As we have said, you play your most crucial games in chouette when you are in the box. This may seem obvious, but we have seen and continue to witness among the group opposing the box violent arguments, growing occasionally so heated that a player will actually quit and walk away in anger. Since such a player usually stands to lose only a third or a quarter of the total stake, this is absurd behavior; yet wherever chouette is played these altercations occur. Resolve never to indulge in such foolishness; even if a technical error is made now and then, relax and let the captain play it his way. In the long run, you’ll save time and avoid petty and unnecessary disputes. In Europe there is a colorful custom called giving for games. Any backgammon player in or out of the chouette can, should he like either side, utter the words “Giving for games.” This means that he will give whatever the amount of the doubler is at the moment to any and all participants for their respective games. He does this because he believes a double is in order, and of course he immediately doubles. The participants must either go along with the double or give over their games to the newcomer. It is an ironclad rule. If it is the box that is being doubled, he may preempt any or all the games, giving the necessary points to as many of his opponents as he wishes. Or he may accept the double outright for all the games. There is a great risk for anyone who makes the offer of “giving for games.” He immediately gives the number of points on the doubler to each player and proceeds to play for twice that number. Thus, if he loses (assuming no redouble or double game), he loses 3 units, whereas his maximum profit is only l. This applies to all the games he has bought, so he must be very sure of the position when offering the proposition. Anyone already playing in the chouette may also say “giving for games” and take over. The only time the tactic is not permitted is when one side is obviously playing for a gammon. “Giving for games” is a colorful addition, especially if a few wild early-doublers are loose in the vicinity. Someone will walk in, notice that because there are so many players he will not be able to play for a long time if he starts at the bottom of the rotation, and therefore announces, “Giving for games.” If he is fortunate, he will vault immediately into the box. There is more fun than science in this European innovation, and since no one is ever forced to make this highly speculative offer, it has become one of backgammon’s more amusing eccentricites. Contrary to your style of play as a member of the partnership, playing alone in the box should not affect your tactics in any way. You should play against four or five opponents as boldly as against one, and not flinch simply because the stakes are higher. If you are doubled, and it is a double you would normally take, you should take it here. A take is a take; nothing but the position of the game should influence your decision. If the sum involved disturbs you, your abilities are being affected adversely. The simplest method of determining just what stakes you should play for in chouette is to multiply the stake by the number of players in the game excluding yourself. For example, if the stake is $1 a point and there are four people in the game, you must ask yourself whether you are comfortable playing for $4 a point and whether you will be able to take a double to $8 with equanimity. If you can, play; if not, find another game. Some years ago in London, a striking example of the stakes you should not play for occurred in a chouette. A man called Gravita was playing against eight other men, most of whom were excellent players. Gravita had been losing steadily for years, but he enjoyed the game and always paid his debts. On this particular evening the stakes were set at £20 (about $50) a point. Toward the end of the evening, Gravita was somewhat ahead, but the game at hand was going against him. The doubler had been turned back and forth to 64, and in mid-game the partnership, sensing an advantage, redoubled Gravita to 128.